Arlington Academy of Hope (AAH) is a non-profit organization dedicated to providing quality education and basic healthcare to children in rural Uganda. Founded by John and Joyce Wanda, who emigrated to the U.S. from Uganda in 1996, AAH has built and now sustains a model primary school and two medical clinics in the Bududa District of Eastern Uganda. The school opened in February 2004, and currently enrolls approximately 331 children in grades P1 through P7. AAH has made tremendous strides in a short period of time to bring education, medical care, and community development to districts in Eastern Uganda. In December 2010, AHEAD Energy President & CEO MJ Ebenhack and AHEAD volunteer Patrick Hsieh made a site visit to AAH. They found electricity to be the highest priority. AAH has an array of solar photovoltaic panels on one of its school buildings, but, being located in a rainy region, solar potential is limited. Since the Sakusaku River flows alongside the AHA property, hydropower may be a better option. AHEAD is working with the Center for Research in Energy and Energy Conservation to conduct a feasibility study for a pico-hydro system. AHEAD has also recommended construction of a biodigester at AAH. Such a digester would turn animal waste, food scraps and human waste into biogas to use for cooking. AAH and AHEAD Energy share common values and approaches in seeking to empower local people to take charge of their own communities. To this end, all joint projects will seek to involve locals in the planning, implementation, and long-term operation of all energy systems. This includes developing the human resource capacity to duplicate and expand systems. 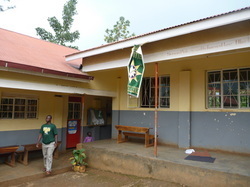 For more information on Arlington Academy of Hope, log on to www.aahuganda.org.